This journey is the ultimate getaway for the adventurous traveler. 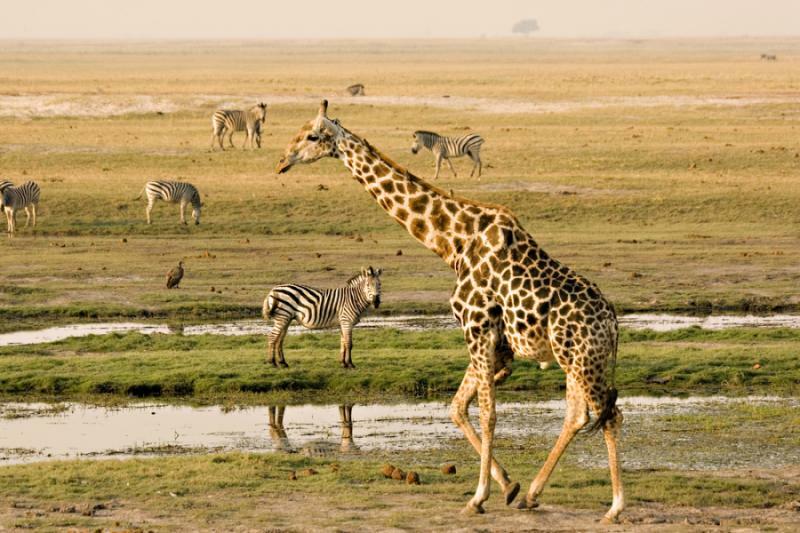 Experience some of southern Africa’s most pristine areas, from vast, unspoiled landscapes to dramatic waterfalls and sprawling lagoons. 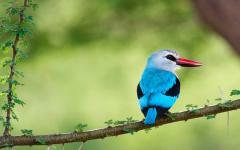 This trip covers both distance and diversity and you will encounter a wildlife paradise unlike any other. 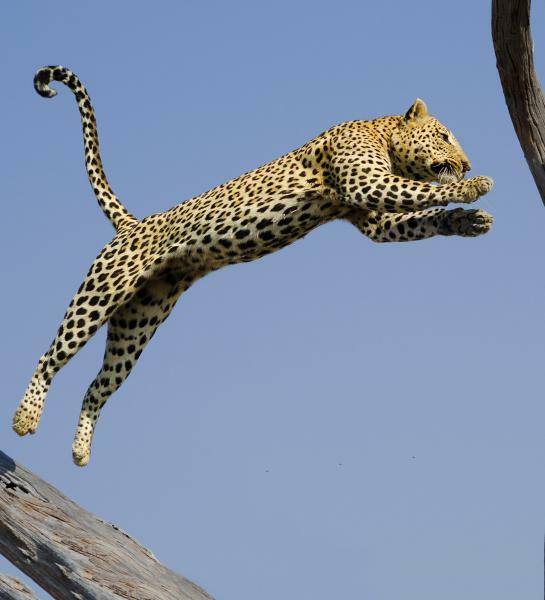 Experience the exhilaration of the bush in luxurious style in Botswana’s Okavango Delta, Chobe National Park, and Victoria Falls in Zambia, and whether you seek excitement and thrills or pampering and preening, it’s all ready and waiting here in the gorgeous remoteness of Africa. 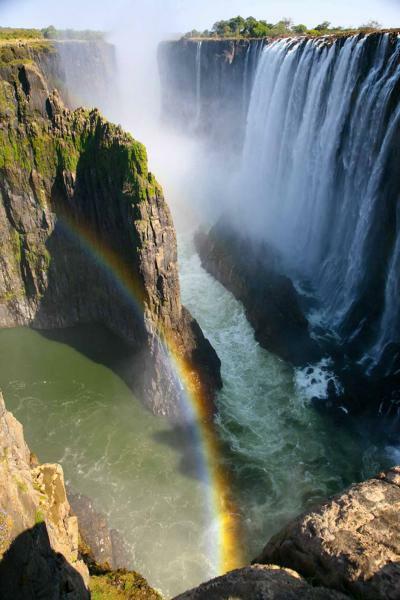 (Day 9): Depart Victoria Falls for Johannesburg to meet your connecting flight home. 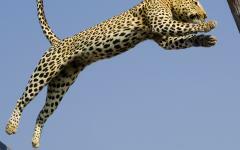 Prepare for the very best that Botswana has to offer. 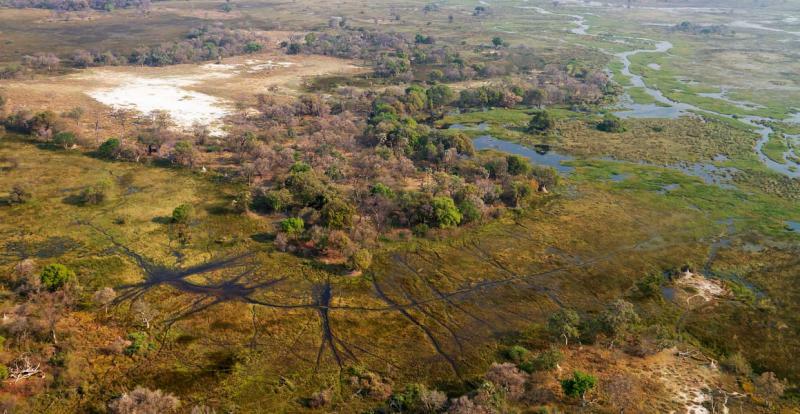 Begin in the cool, gleaming channels of the Okavango, where your sojourns in the Moremi Game Reserve will open your eyes to truly spectacular animal and birdlife. Your first lodge, Xakanaxa Camp, will give you a taste of what is still to come, as you experience your first forays into the bush with your experienced and knowledgeable guide to spot lions, leopards, elephants and more. 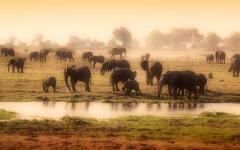 Wake at dawn to be out by first light, and have your breath taken away by your first African sunrise. Later in the day, head out into the gorgeous afternoon light to find predators stalking their prey into the night. Next you will head to Kwara, where this paradise will continue to amaze you. 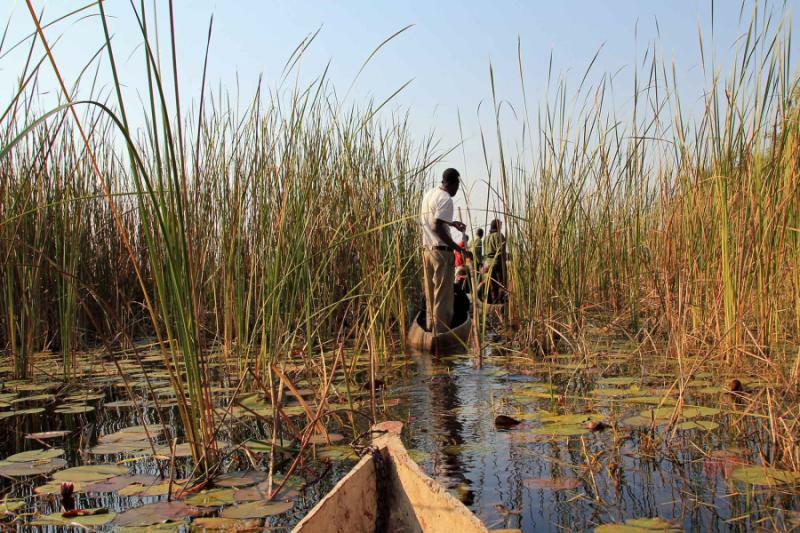 Experience a soundless and magical mokoro ride through papyrus-flanked waterways; watch for the flickering wings of a Pied kingfisher, the tell-tale pink nostrils of a basking hippo or the distant flap of an elephant’s ears as he shakes a palm tree to reach its fruit. Walk in the footsteps of African giants on a bush walk with a guide to point out the finer details of the flora and fauna. Gaze at the wondrous African stars at night, and look back on a fabulous day. 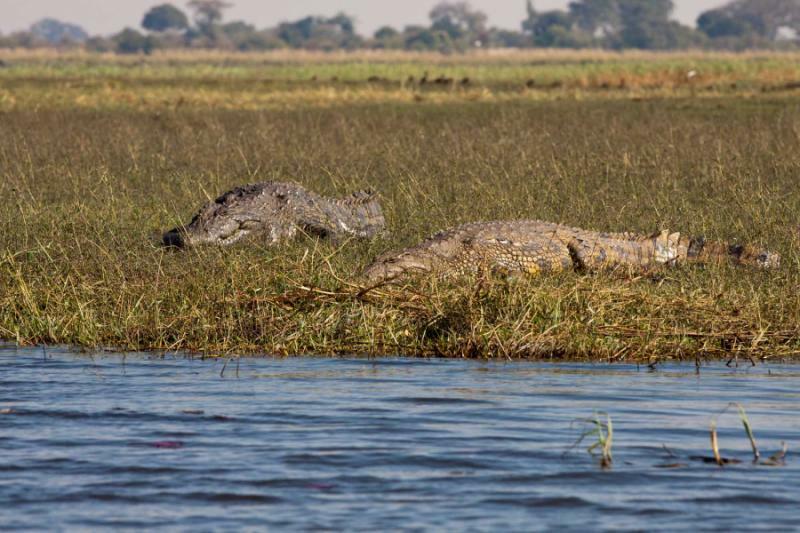 After the lagoons and swamps of the Delta, the great river of Chobe will invite you to a different paradise as you arrive at Chobe Marina Lodge. Here you will be in the land of elephants, and there are more game drives to enjoy as well as sunset river cruises and views of one of the most beautiful national parks in the world. 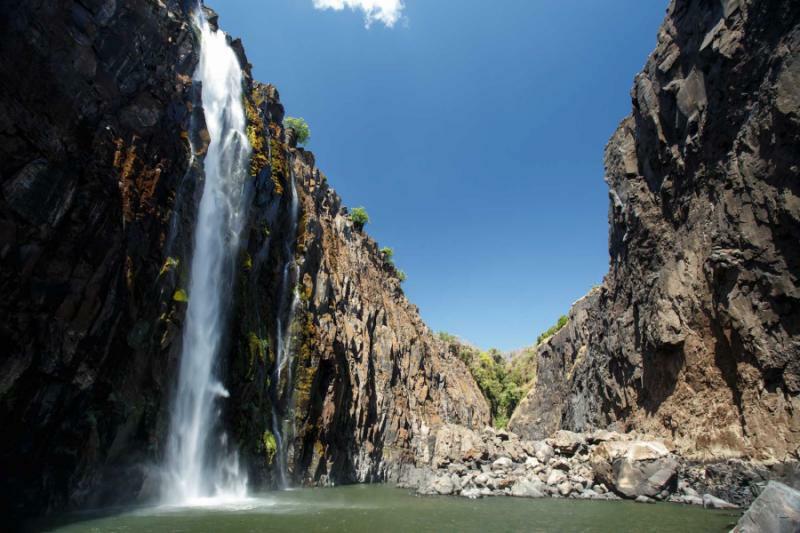 After two blissful nights here, you have the chance to extend your trip to include the breath-taking Victoria Falls. Stay two nights within sight and sound of this famed Natural Wonder of the World, and experience the vast range of activities on offer here to end your African adventure in style. 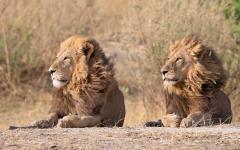 Or, consider extending your visit to Botswana. 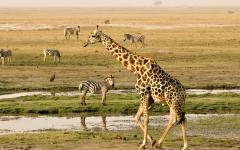 Take a look at the safari reviews of Botswana for additional information and ideas. 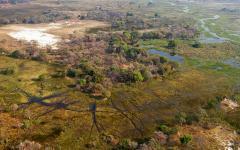 Days 1 - 2: Welcome to the Moremi Game Reserve! 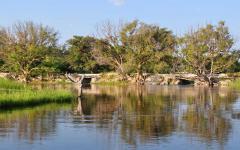 Once you have arrived in Maun, you will be within tantalizing reach of one of Africa's greatest natural wonders. 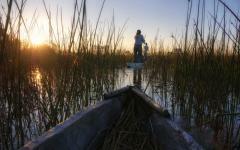 Ahead of you is your first destination, just a short flight away, at Xakanaxa Camp in the heart of the Okavango Delta. This unique ecosystem is a geological marvel, brought about by a tectonic trough within the dry and dusty land of the Kalahari Desert. The rains that fall in the highlands of Angola flow down to this alluvial fan and create an oasis of spectacular and diverse scenery, wildlife and birdlife. 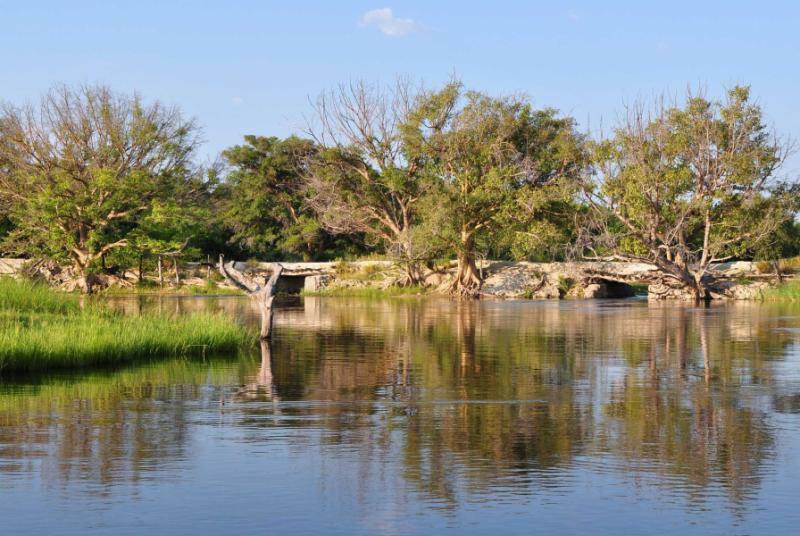 The charming Xakanaxa Camp (pronounced Ka-ka-na-ka) is an elegant lodge created from local timber, reed and thatch and is nestled in the Moremi Game Reserve. This reserve was named after Chief Moremi of the BaTawana tribe, and is the ideal location for your initiation into the wilds of Botswana. At Xakanaxa, your home for the next two nights, enjoy your private and secluded view of the lagoon in front of camp, or venture to the cozy fire-side lounge for cocktails in the evening. There is a swimming pool with a breath-taking view and you can lay back and watch out for some of the famous bird species of the area, or explore the watery channels of the Xakanaxa area by mokoro. 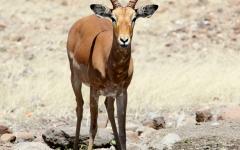 For your Botswana vacation and safari, your expert guide will take you on a journey in search of wildlife. The next two days will include morning and afternoon game drives. After a peaceful morning sleep-in or a last morning activity at Xakanaxa and a delicious breakfast, you will be transferred to the airstrip for your flight to Kwara Camp, deep in the crystal permanent waters of the Okavango Delta. The camp consists of eight gorgeous safari tents elevated on wooden boardwalks and decks, hidden in amongst the cool and inviting riverine woodland. Resident hippo will serenade you from the water on the floodplain in front of the camp. Each tent has its own viewing deck and a breath-taking view over the Delta, so that if you wish, you needn’t leave the comfort of your own room for your safari! 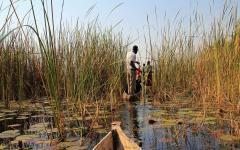 During the next two days at Kwara, experience the elegantly serene aspect of the Okavango. 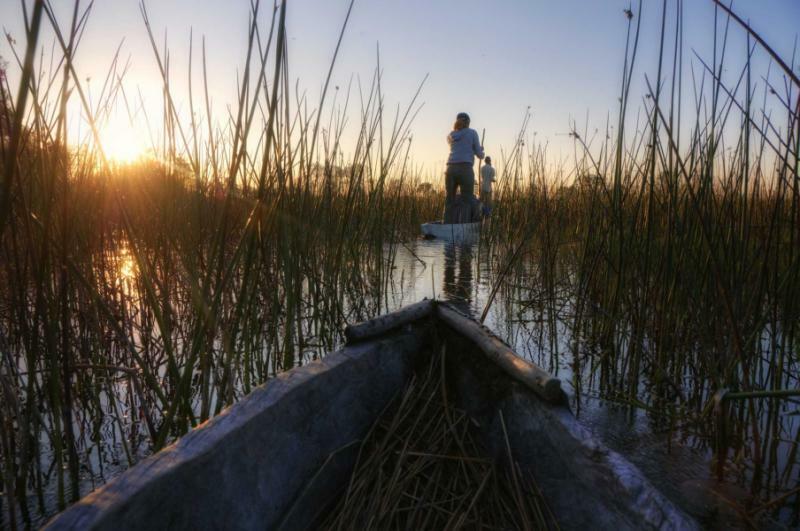 There is no better way to do this than to climb into a mokoro and be propelled gently through the glassy waters of the Delta by an expert poler. 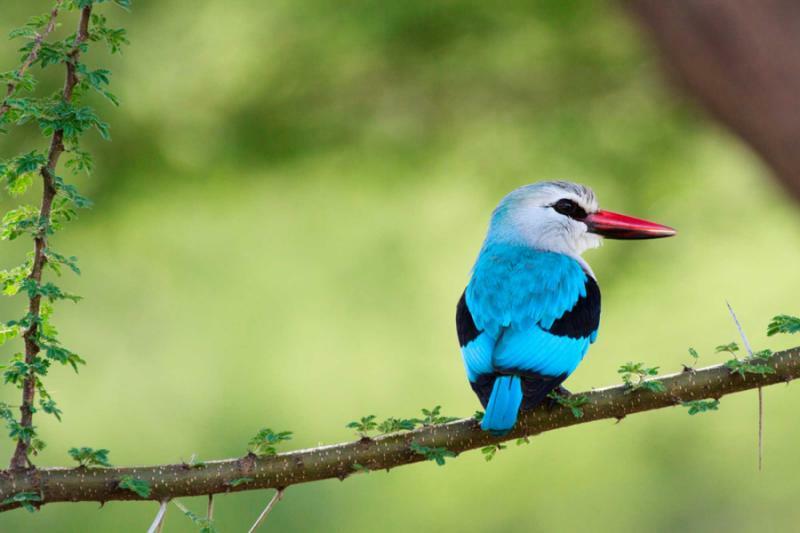 Serving as your guide, your poler can point out some of the hidden gems of this stunning wilderness, such as kingfishers, herons, crocodiles and perhaps even a fish or two! 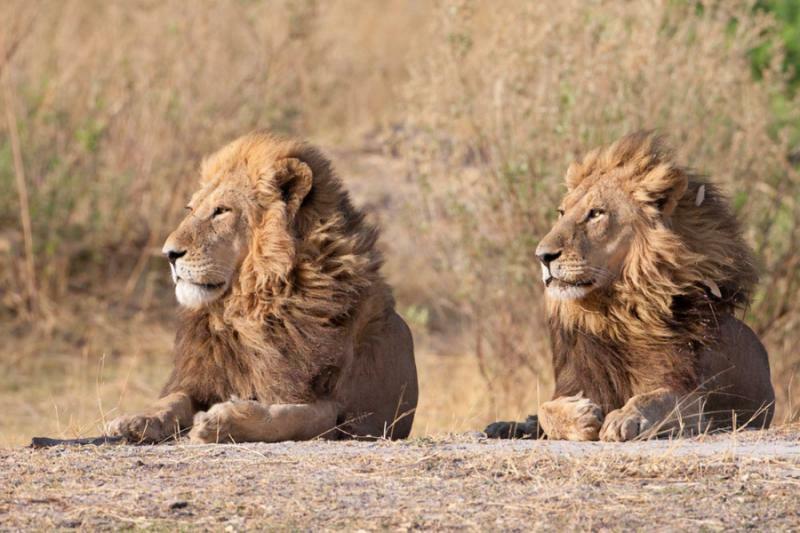 After a relaxed lunch and siesta, head out once more in a vehicle and end the day with an exhilarating game drive, searching for predators on the hunt in the cooler air. 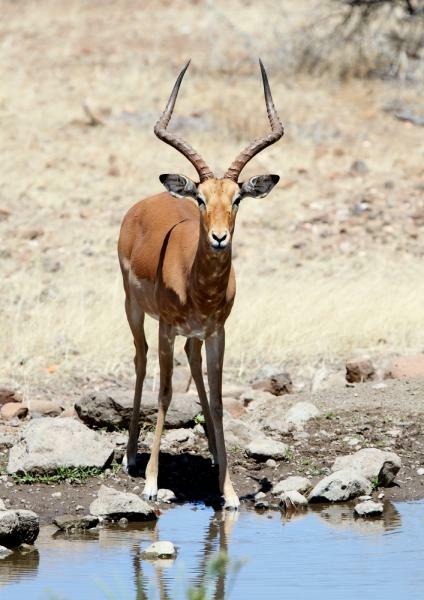 The next morning, why not complete the true safari experience with a bush walk where you will be able to appreciate fully the finer details of this paradise. Your guide (who will carry a rifle whilst walking as a safety precaution) will open your eyes to the science and skill of tracking animals on foot. From game drives, to bush walks, to mokoro safaris, to a relaxed sojourn in the double-tiered boat, Kwara has a huge range of activities on offer to allow you to truly soak up the blissful landscapes both on land and on water. There are windy, meandering channels, wide lagoons (for some superb fishing), swaying palm trees, and cool, dark forests to explore. In this private concession you will be able to traverse sensitively off-road if you are following a predator on the hunt and at night your guide will use a spotlight to illuminate some of the nocturnal beauties of this wilderness. Whether you wish to venture out on these many excursions or stay in the comfortable luxury of camp, the warm and friendly staff at Kwara will ensure that you have an unforgettable stay. After your usual early morning wake-up call with a cup of coffee and biscuits, head into the bush for a last look at the gleaming Delta before you leave for your next destination, in the Chobe National Park. Here, where the largest elephant population in the world treads determinedly across the dusty ground and the African Fish eagle swoops down to the great river, uttering his charismatic call, you will find a new Botswana wilderness to explore. 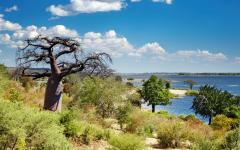 You will stay at the glorious Chobe Marina Lodge, located at a convergence of countries in a faraway tip of Botswana. 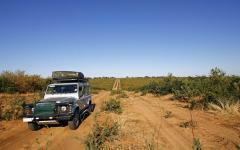 Within reach of Zambia, Namibia and Zimbabwe, you will have access to a range of Southern African landmarks and game reserves. 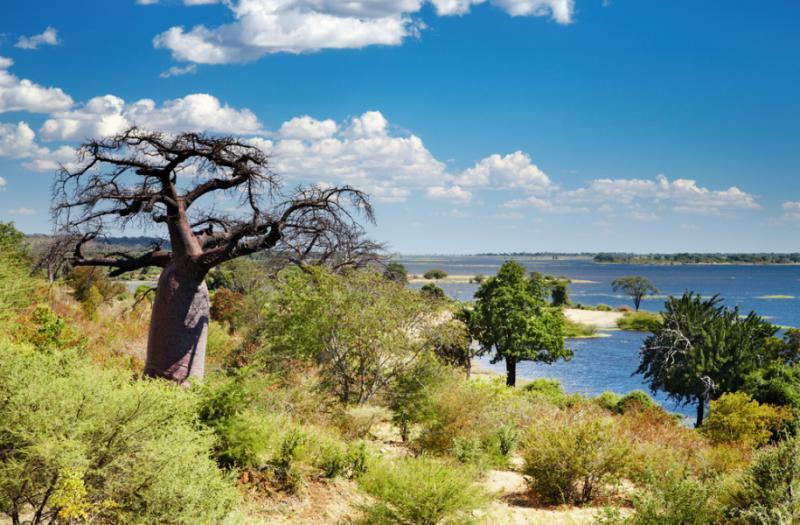 Whether you stay within Chobe National Park, explore the Zambezi River or venture into the Kasane Forest Reserve there are endless activities to partake in. 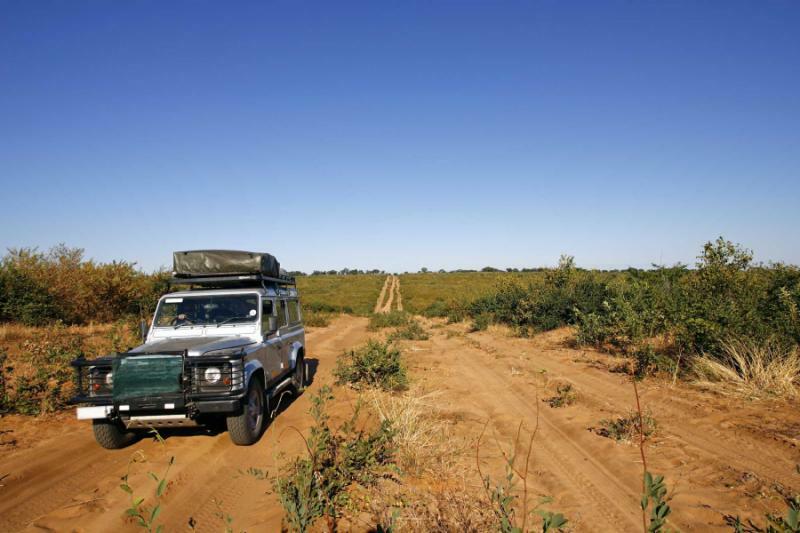 You are once again encouraged to leap aboard a 4x4 and head into the bush, and later enjoy a sunset river cruise to see a new perspective of Botswana’s wildlife. The endless pods of hippo and families of elephants crossing the river provide even more photo opportunities and unforgettable memories! Take a sightseeing cruise to Sedudu Island for more stunning scenery. 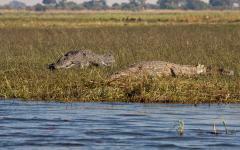 For all thrill-seeking fishermen, tiger fishing in the Chobe and Kasai rivers is a must-do. There is so much to see and do, but there is always the comfort and serenity of the lodge if you would like to simply sit back and watch the magic of the Chobe unfold in front of you. After a leisurely morning enjoying and soaking up the delights of Chobe (whether it be with breakfast in bed or an adventure in the bush looking for animals) you will be transferred to Kasane for your onward flight home. If your craving for African adventure has not quite been satisfied, why not head to Livingstone and experience the wonders of “The Smoke that Thunders”, at Victoria Falls? Transfer over land to Livingstone where you will be taken onwards to the Zambezi Sun Hotel, located on the edge of the Eastern Cataract of the falls, or the Royal Livingstone Hotel, set along the Zambezi River. In the evening, indulge in a relaxed boat ride at sunset, cruising down the river with your eyes peeled for animals coming to the water to drink, or even crossing the river. Sip on a chilled glass of bubbly onboard, and enjoy a light snack as you watch the sun set. 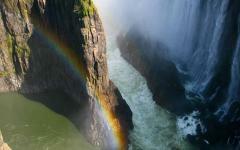 After breakfast depart on a guided tour of Victoria Falls, one of the Seven Natural Wonders of the World. This walking tour takes you through the magnificent rain forest where you are able to view the falls and feel that famous mist upon your face. Twice the height of Niagara and twice the width of Horseshoe Falls, “Mosi-oa-Tunya” (“The Smoke that Thunders”) is truly breath taking, and the world’s largest sheet of falling water. Walk in the footsteps of David Livingstone, the Scottish missionary and explorer who came across these falls during his explorations in 1855. Visit one of the most famous features of this thundering wonder, the Devil’s Pool, which is only accessible to visitors at certain times of year. Enjoy a rather adrenalin-fueled dip in a pool that develops with a current minimal enough to safely swim in, within tantalizing reach of the point where the falls descend into an abyss! 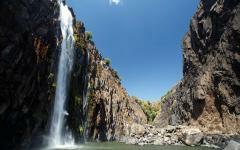 There are many and varied activities in and around Victoria Falls. There is white-water rafting, bungee jumping, boat excursions, fishing, craft fairs, and beautiful walks for those keen on one last outdoor experience! Or, enjoy a last pampering at the hotel. The last morning is at your leisure until you transfer to the airport for your onward flight to Johannesburg, where you will catch your connecting flight homewards.